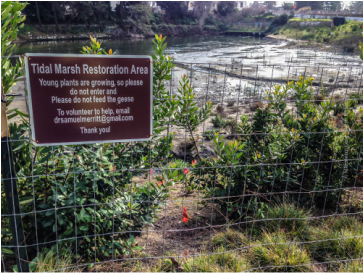 Join volunteers helping to maintain the landscaped areas around Lake Merritt funded by the 2002 Measure DD Clean Water Safe Parks bond measure. Following a model used successfully at the Morcom Rose Garden, an ad hoc group of citizens have organized themselves to be trained by Public Works staff to perform assigned tasks such as mulching, weeding, deadheading flowers and general cleanup. Oakland Public Works‘ parks maintenance staff, led by Crew Leader Juan Cana supports our work. Join a Weed Warriors work day. 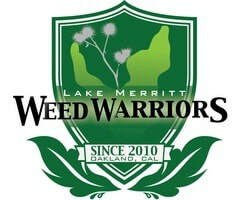 ​Lake Merritt Weed Warriors received the 2017 Parks Stewardship Award by the Oakland Parks and Recreation Foundation in recognition of the LM Weed Warriors volunteers outstanding contribution to the landscaping of the Lake Merritt shoreline. 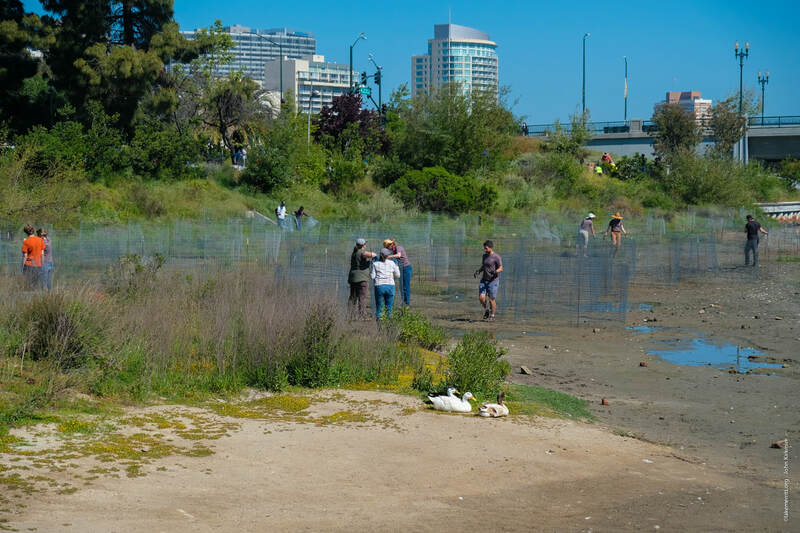 The Lake Merritt Weed Warriors will be working along the path above the tidal marsh on Saturday, October 28, 2017, 9 a.m.-12 noon. Although the main focus is to remove weeds alongside the path itself, there are a few tasks down on the tidal marsh terrace for those who are interested. If you haven't been by the tidal marsh lately, it will be a good time to check it out. The upper terrace that was a bare mudflat when we first started our volunteer work is now a knee-high thicket: primarily saltgrass, there is also Jaumea, Frankenia, Grindelia, and the occasional Limonium. The lower part of the terrace has an expanding wave of pickleweed, thanks to a few iterations of fencing that has prevented grazing of seedlings by Canada geese and coots. The new bridge at 10th Street is complete, and the pathway under it was recently opened for bike and pedestrian use. That southern end of our marsh terrace is still inhabited only by our circular cages of pickleweed, but our hope is that the City will install temporary fencing soon to exclude the geese, allowing the pickleweed to spread beyond the cages. For drivers, plenty of free parking is usually available at the adjacent parking lot of the mothballed H.J. Kaiser Convention Center (10-10th St). Wear sturdy shoes and bring gloves if you have them -- we'll have loaners if you don't. So come on out Saturday morning and enjoy fresh air, light exercise, and botanical bliss at the Lake Merritt Channel!